MnDOT employees around the state donated time, food, toys and money for those in need during the holiday season. Their efforts made a difference in many people’s lives during the holidays. Duluth employees donated toys during a drive for Toys for Tots. District 2 had a Holiday Giving Tree to support Public Affairs Coordinator TJ Melcher, who is serving in Iraq with the Minnesota National Guard. 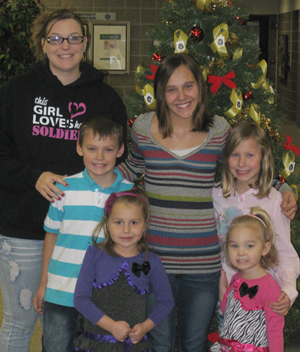 Employees decorated a tree with ornaments that represented a gift to Melcher's family. As Christmas drew near, the family came in to have pictures taken with the tree and to receive the gifts and well wishes from Melcher's District 2 family. St. Cloud employees donated 56 toys and $1,065 for Toys for Tots. The employees also donated 67 pounds of food to the local food shelf. 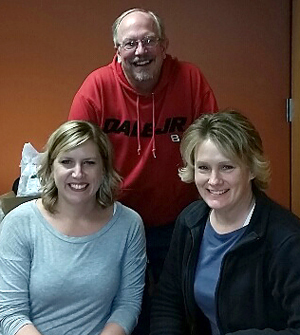 Baxter employees donated three Santa bags full of toys and $455 cash to the Brainerd Lakes Kids for Toys. The local AFSCME Union also donated an additional $300. The 20th Annual Hospice Charity Potluck raised $2,400 for Hospice of the Red River Valley. Since the district started hosting the event in 1995, $24,515 has been raised for Hospice. Current and former employees donate a variety of items, many of them handmade, for the potluck and charity drawing. The annual Toys for Tots donation drive was held in Owatonna, Rochester and Winona. District 6 has collected toys for 12 years. The employees and visitors filled up the bins several times. They also collected more than $500 in cash donations. A group of District 6 employees took vacation time Dec. 26 to build a ramp at the home of Dennis Kinsley, a MnDOT mechanic who is in hospice care in his battle with cancer. The ramp will help Kinsley’s family as they care for him. He’s been on the minds of many of his co-workers and they viewed it as another way to show their support and concern. Employees donated money and materials for the project and the local AFSCME union donated money. 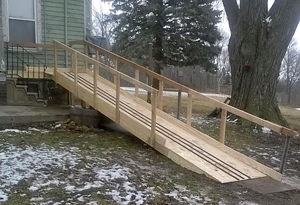 Those who helped build the ramp were Gary Waletzki, Doug Oswald, Don Oswald and Barb McWhirter. Employees volunteered to ring the bells for the Salvation Army Red Kettle program, collected food for the Echo Food Shelf during the Mankato Headquarters Christmas potluck and participated in the State Patrol’s Toys for Tots drive. Gene East coordinated a toy and money drive during the holiday party in Willmar for the Salvation Army’s Toys for Kids drive. They collected toys and gently used hats, gloves and coats. The cash donations totaled $180. Central Office employees held two fundraisers and received a donation of $500 from the Hiway Federal Credit Union. The Office of Financial Management held its third Annual Holiday Fundraiser and raised $577. With $233 of the Hiway donation added, $800 was donated to Second Harvest Heartland hunger relief organization. Nancy Stone collected $241 in the charity collection jars that were placed around the building. With $267 of the Hiway contribution added to those funds, a total of $508 was donated to the Family Place Shelter in St. Paul. Employees donated more than 500 hats, mittens, scarves and socks for children at Dayton’s Bluff Elementary School in St. Paul. The event was organized by the Hiwayan Club. The commissioner’s staff donated toiletries, long underwear, hats, sock and mittens, along with $175 in cash to Simpson Housing Services. The donations helped homeless individuals and families during holidays. Oakdale employees held two events for Minneapolis Children’s Hospital. They collected non-perishable food items for patients and their families. The employees also made 70 blankets to be placed on children’s beds before they check-in. 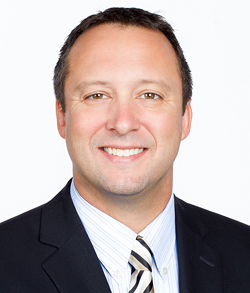 Sean Rahn has been appointed as an assistant commissioner for policy. He started Jan. 5 at the Central Office. Rahn worked as a senior government relations manager for Best Buy Co., Inc., since 2011. Prior to that, he worked as a senior policy advisor for Gov. Mark Dayton and as legislative director to the Speaker of the Minnesota House of Representatives. He has a master’s degree in planning from the University of Minnesota-Humphrey School of Public Affairs. Transportation is expected to be a high-priority topic at the state and federal level this year. The governor is expected to propose a significant funding increase. If enacted by the Legislature, the proposal would result in additional investments in highways, transit and other transportation modes. “We are fortunate to add Sean to our team as his experience and expertise will help us a great deal this session,” said Zelle. “I appreciate Commissioner Zelle’s appointment and look forward to working with the team at MnDOT, the Legislature, and other interested stakeholders to further Minnesota’s transportation goals,” said Rahn. Rahn can be reached at sean.rahn@state.mn.us. Nancy Daubenberger was appointed director of the Engineering Services Division. She began her new role Jan. 5 at the Central Office. Daubenberger has been with MnDOT for 15 years, and most recently served as the state bridge engineer and the director of the Bridge Office. She worked in other planning and management capacities in the bridge office as well as in the Metro District. Prior to joining MnDOT, Daubenberger worked for the SEH and STS consulting firms performing bridge and road design work. 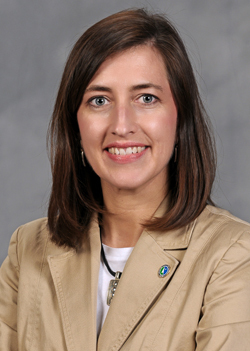 She holds a bachelor’s degree in civil engineering from North Dakota State University and a master’s degree in civil engineering with a structural emphasis from the University of Minnesota. Daubenberger can be reached at nancy.daubenberger@state.mn.us. MnDOT’s Transportation Research Innovation Group and the Local Road Research Board announced their Fiscal Year 2016 funding awards this week after hearing proposals from researchers in several states. They selected 20 research proposals hallmarked by novel approaches to improving the environment, increasing transportation safety, improving construction methods and boosting the bottom line. Researchers will test new technology that could make crack-free pavements; find better, faster and less expensive ways to reclaim roads; and explore how to use waste material from road construction projects as part of the landscaping to absorb water runoff. Click here for a summary of all the projects. 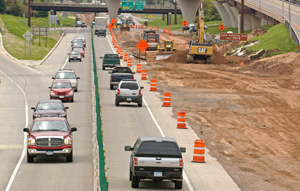 MnDOT employees can learn more about transportation funding at the Get Connected website. Find information, tools and resources about how MnDOT and Minnesota transportation is funded. When there is a water or drainage problem on or near a road, often the trouble lies beneath. That’s when Mike Juen goes to work. Juen is a senior transportation generalist in the bridge office who remotely operates a video camera in MnDOT’s vast stormwater network to find trouble spots. The camera records images and transmits data into software that organizes it into a database. The software generates reports other departments use to fix the problems. Juen has worked at MnDOT for 15 years, seven of them operating one of the two cameras used to inspect the stormwater system. Juen and second crew member, Tony Audette, travel statewide to use one of the cameras. A second two-person crew travels in the summer only. In the Metro District alone, there are 950 miles of pipe and 41,000 catch basins or manholes. We get requests from Water Resources, subarea supervisors, construction inspectors and even from out of state to videotape pipes. Most often we get plan sheets highlighted with the pipes and structures that we need to videotape. The camera is on wheels and is lowered into a structure, such as a manhole or storm drain, via lifting and lowering cables. The camera can also go into open areas like drainage ditches, culverts and catch basins. I operate the camera and the tractor it sits on with joy stick controls from our trailer. Everything is recorded on a computer hard drive. When a problem is spotted, the software program allows us to enter in descriptions of what we observe. This allows the reviewer to know the exact location and other information about the problem. When I’m done videotaping the area, I reverse the camera out of the pipe and the tractor has a backup camera on it for managing the cable during the process. What kinds of damage/problems do you see? We see rusted and rotted pipes, plugged pipes from debris, crushed pipes, guardrail posts and sign posts through pipes and joint separations. The freezing and thawing of pipes and salt are often the causes of pipe deterioration. We also see utilities that are jacked through pipes. Problems in utilities can also be bricks deteriorating, voids around pipes and deteriorating rings. We also inspect new construction to ensure that it has been installed properly, and inspect sleeve pipes to make sure that the pipes are fully snapped together. We also film and inspect structures and catch basins. The camera is water resistant. It pans and rotates 360 degrees and can take still shots. The tractor has an inclinometer on it to help determine the grade of a pipe. The footage of how far the camera and tractor are out is also recorded. The tractor is steerable, which helps to go around bends in pipes and get in pipes from structures. There is 1,100 feet of cable for the camera to travel. What is the financial efficiency of using this software? 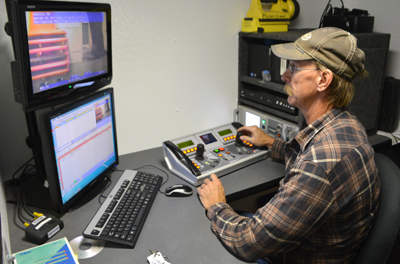 MnDOT has had pipe inspection video equipment for about 18 years. The old system recorded to VHS. The computer software program we use today downloads the information on a computer hard drive and we put it on a DVD or flash drive. The download only takes a few minutes. The reviewer can see all our observations in a list and go directly to the problems instead of watching the entire video, which could be hours long. Storage of the DVDs and flash drives also takes up less room than the VHS tapes. The information can also be transmitted digitally in real time, which enables faster response times to fixing the problem. What do you enjoy most about your job and what are the challenges? The challenge we have most often is when we inspect a pipe and it’s full of water or debris. Then we have to de-water, or flush, the debris out. We also get emergency jobs that mean other projects have to wait and get reprioritized accordingly. Other challenges are when we go in pipes that have holes. We have to be careful not to get the tractor stuck. I enjoy the challenges we face, going to different areas around the state and working outside.